Last weekend was perfect. Sunny weather, an extra day off from work, the unofficial start to summer… Instead of going “down the shore” as we say here in Jersey, I came down with a cold. When I get sick, I go all out. I don’t spend a day or two feeling like crap and then bounce back. I get bring-in-the-CDC-and-maybe-a-voodoo-healer-for-good-measure sick. The highlight of every day this week has been bedtime, except for that one night there was a freaking giant spider running around on my bed. Unfortunately it was real, and not some Nyquil induced hallucination. So now it’s another lovely Saturday and I STILL feel like garbage! In order to cheer myself up (and in hopes that some alcohol might kill of the super germs that have taken over my body) I decided to make myself some sangria. At first I browsed some recipes online but a lot of them required ingredients that I didn’t have, nor did I have the energy to put on some respectable clothes and go to the store. So I decided to just wing it with stuff I had in the house. Not only does it taste great, I just LOVE the colors! 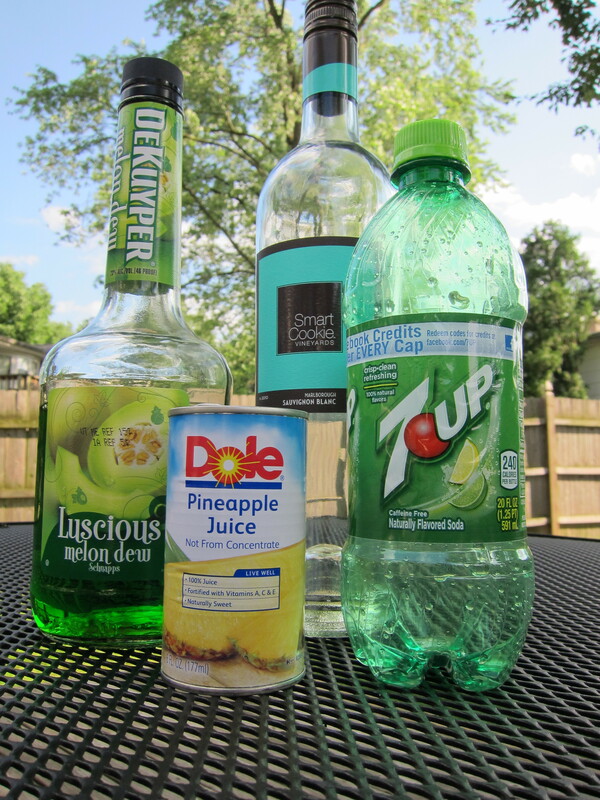 Combine wine, soda, pineapple juice and melon liqueur. If desired, add agave nectar to taste. 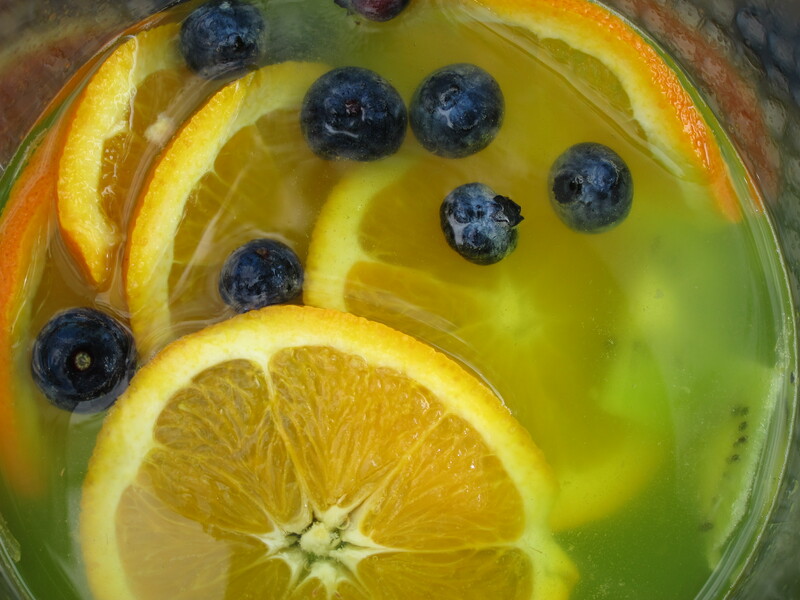 Give it a good stir, then add blueberries, orange slices and sliced kiwi. Let sit in the fridge for a least an hour to let the flavors combine. Then…enjoy (preferably in a nice sunny spot on the porch)! Peanut Rum Creme. Sounds a little strange, no? 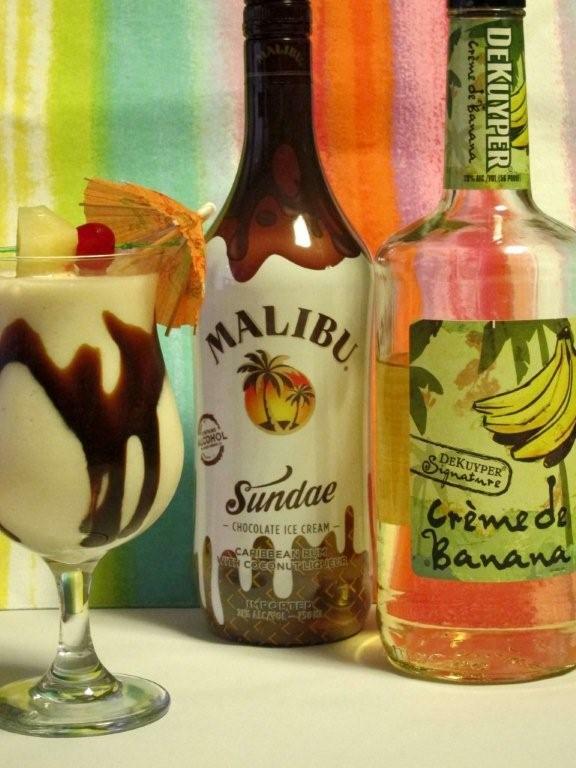 This is what I thought when I saw a drink called Banana Nut Bay on the menu at Rum Bar in Philadelphia last year. However, other ingredients were Creme de Banana and cream of coconut and I figured something with those flavors could never be bad so I ordered it. Oh Happy Day! 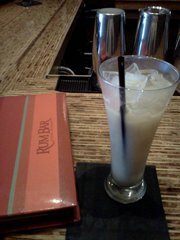 This drink was soooo good! It reminded me of boozy Gerber Baby Bananas. (Yes, sometimes I buy a jar of baby bananas for a snack, so what?) Now, it was last year that I had this drink. 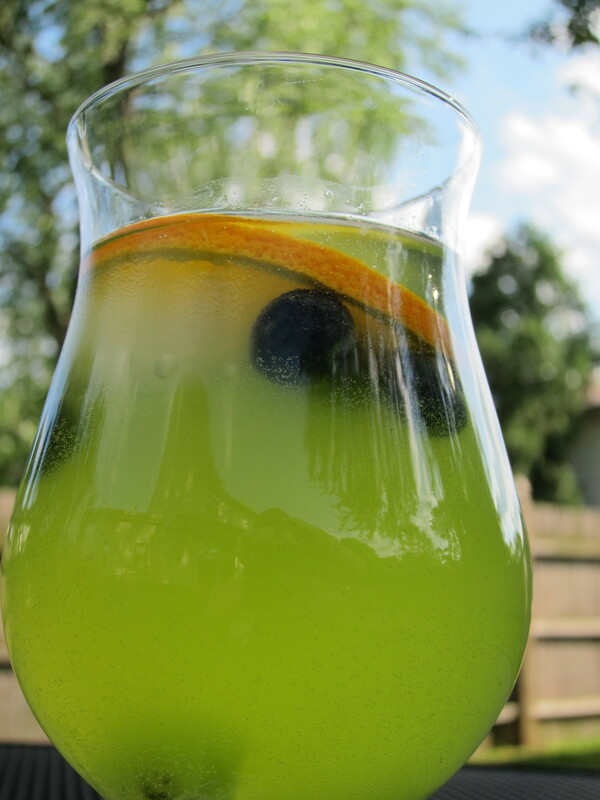 I don’t know what made me think of it today but I checked out Rum Bar’s website and it appears that – for some bizarro reason – this tasty concotion is no longer on the menu. For a brief second I was broken hearted, thinking I would never again taste such deliciousness, but then I remembered Google. And so, here is the recipe! But wait – there’s more!! A few months after Banana Nut Bay, I was having brunch at Max Brenner’s and what do I see on the menu but another drink made with Peanut Rum Creme! This drink was called Satisfaction Guaranteed, and it did not disappoint! Castries Peanut Rum Creme, Caramel Liqueur and milk chocolate. 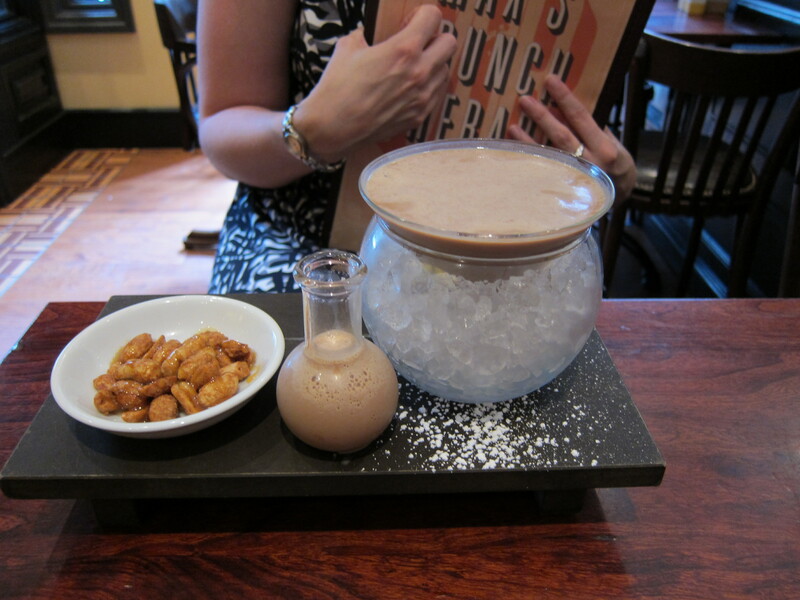 It was a damn good drink on its own…extra bonus points for presentation! I would say Peanut Rum Creme would definitely make a a great addition to any home bar! 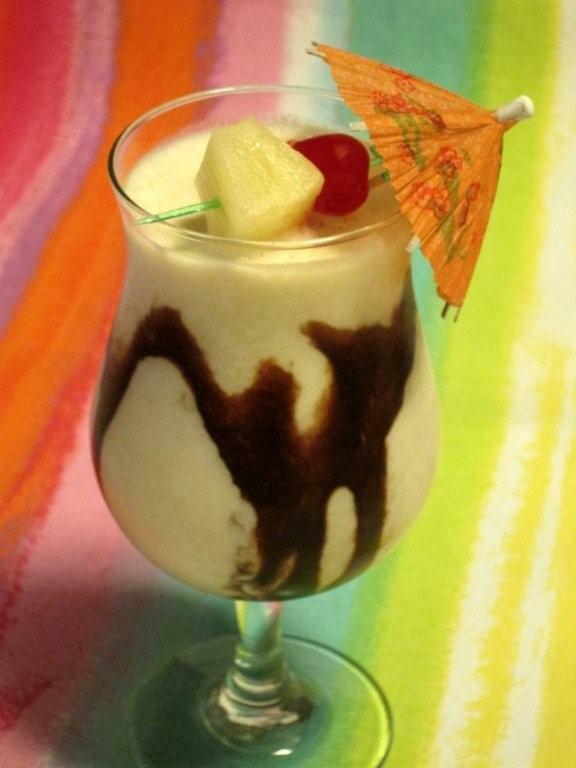 Don’t worry, I’m not making Sweet Tea Piña Coladas. This post is a two-fer! 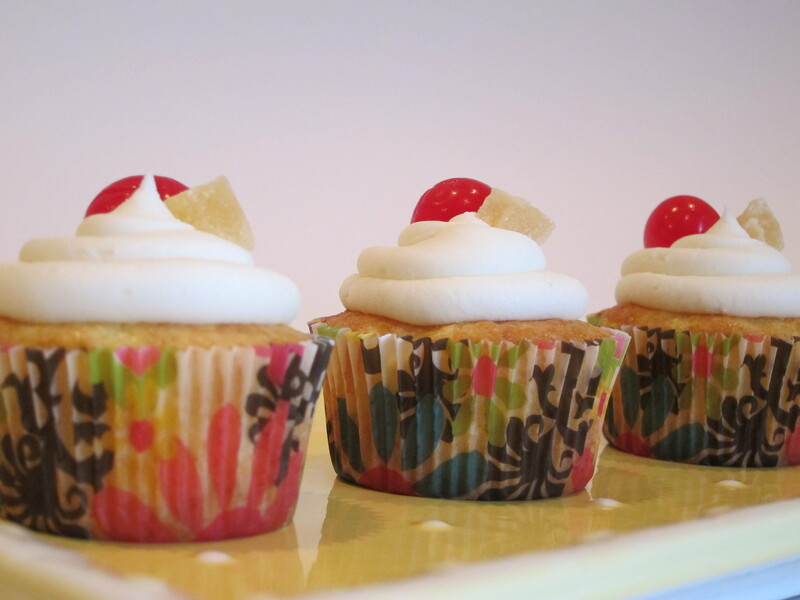 First off – Piña Colada cupcakes!! There was another birthday in the office last week. This time I went with Piña Colada cupcakes. I recalled an at-home jewelry demonstration where the birthday girl consumed quite a few pineapple Jell-o shots made with coconut rum, so I knew she’d love the flavor combo. At first I considered incorporating some coconut rum into my cupcake batter, but all I had was a bottle of 90 Proof Parrot Bay. I’ve baked using a little bit of alcohol before (made cupcakes with some Caramel Bailey’s once) but for some reason the thought of sticking 90 proof booze in a hot oven filled my head with thoughts of cupcakes on fire so I decided to skip it. Instead, I grabbed another boxed cake mix and in place of the water I used pineapple juice. I also folded in some crushed pineapple. I went with my basic buttercream recipe and put in a little coconut extract. 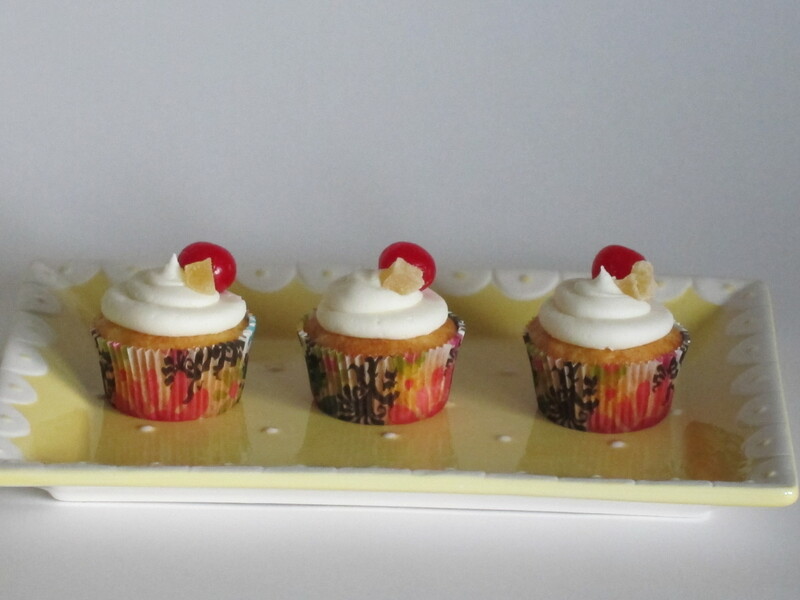 One of my favorite parts of a Piña Colada is the little plastic sword skewered through a cherry and a chunk of pineapple, so I mirrored that on my cupcakes using a dried pineapple bit instead of fresh fruit. I seem to recall an episode of Cupcake Wars where the baker got bashed for putting a maraschino cherry on top of her cupcakes as decoration but the judges were obviously being idiots that day. 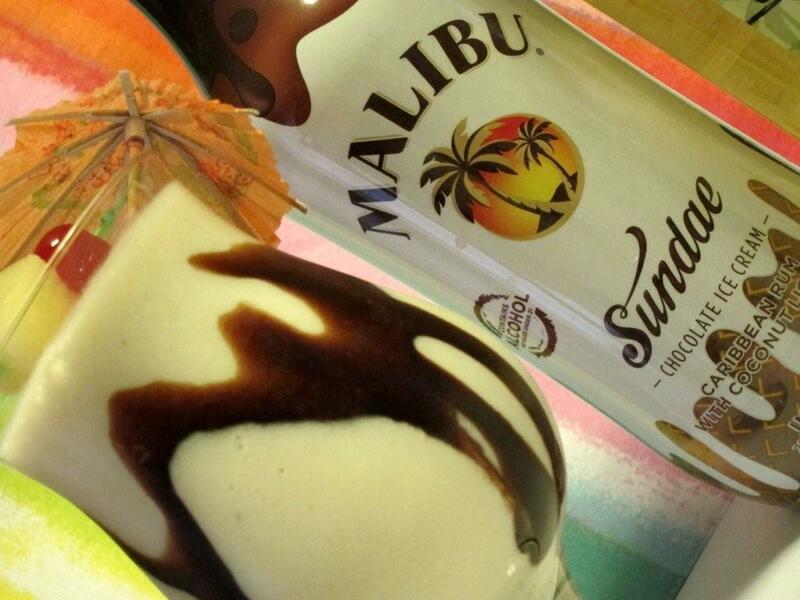 There’s a reason the phrase “cherry on top” exists! The balance of pineapple and coconut was perfect, and I ended up helping myself to a second one of these before the work day was done. In other news that actually does involve alcohol (time for all you underage kids to go back to looking up Justin Bieber or whatever it is you do these days)… A coworker was telling me about Jeremiah Weed Sweet Tea Vodka on Friday afternoon. I’ve heard of Sweet Tea vodka obviously, and I had seen this brand in the liquor stores but hadn’t tried it. 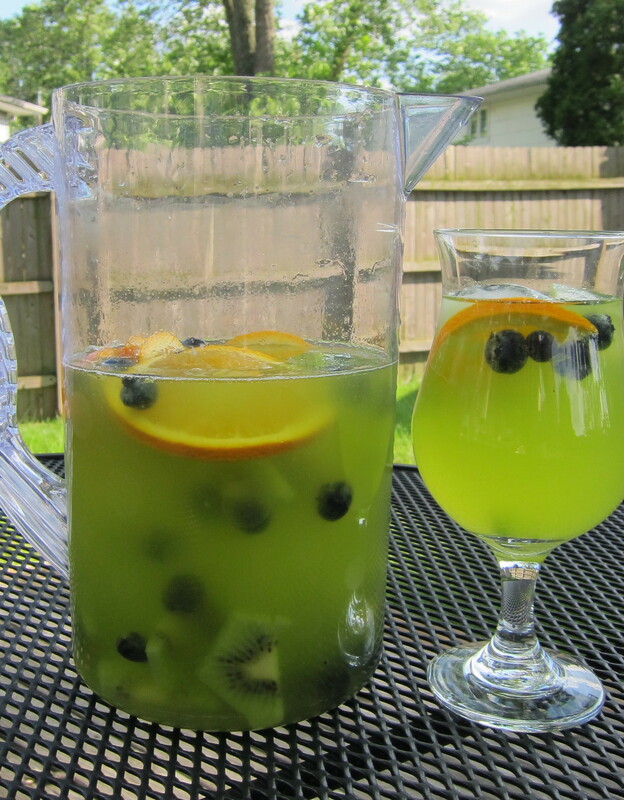 She said that you can make a great boozy Arnold Palmer by mixing it with lemonade. That night, I was out at a local bar/restaurant and what should be on the happy hour menu but a Jeremiah Weed Arnold Palmer for just $5? Yup! I had to try it and I’m glad I did! 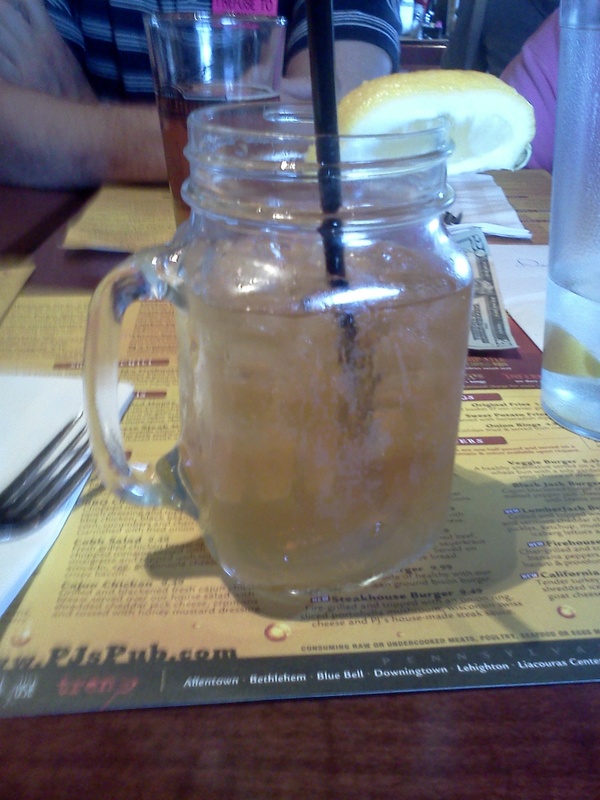 It came out in a mason jar type glass garnished with a lemon wedge and tasted dangerously just like iced tea lemonade. 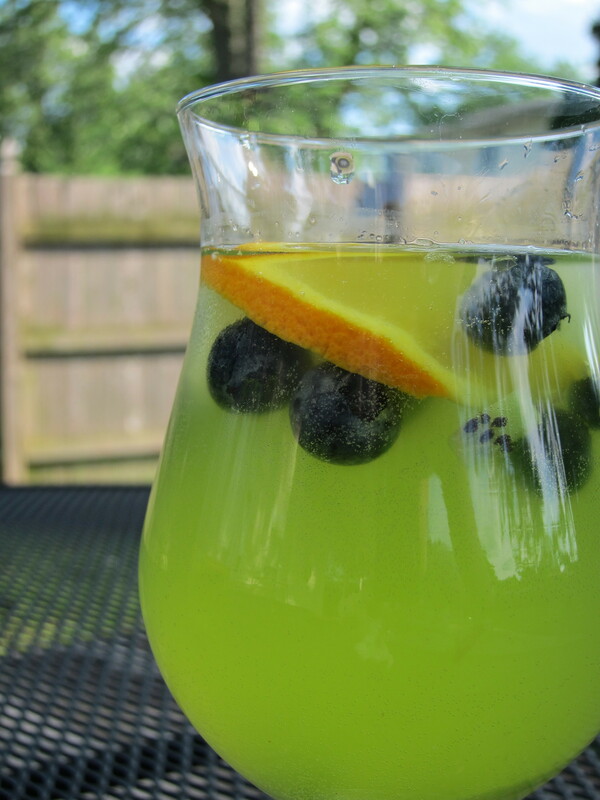 I’m not sure what the ratio of lemonade to sweet tea vodka was, so I can’t give you an exact recipe but I’m sure you won’t mind experimenting to figure it out on your own! 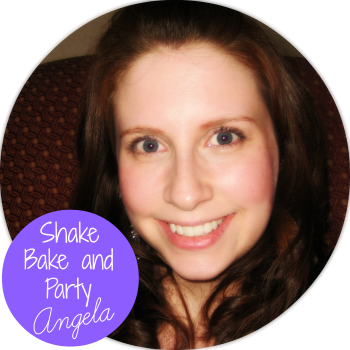 If I hadn’t been the chauffeur for the evening I would have doubled up on this drink the way I did on those Piña Colada cupcakes! Prepare mix according to directions on box, subbing in pineapple juice for the amount of water called for. In my case, I needed one cup of water. I drained the juice from the crushed pineapples into a measuring cup and then used Dole pineapple juice to get the 1 cup needed. Once you have beaten the batter for the requisite two minutes, gently fold in the crushed pineapple and bake according to the directions on the box. 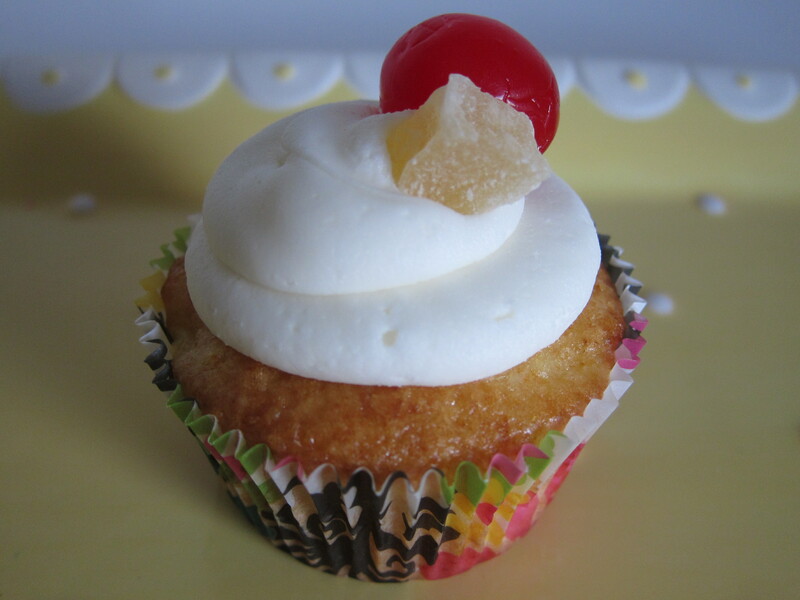 For the coconut buttercream, use the same basic recipe from my Cherry Lemonade cupcakes but instead of the grenadine use 1 teaspoon of coconut extract.